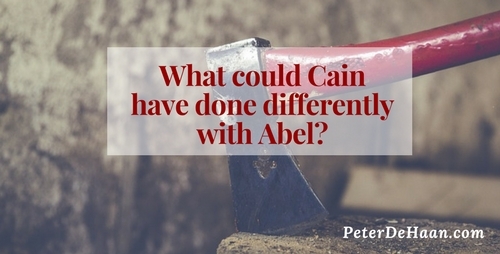 What Can We Learn from Cain and Abel? Sibling rivalry and murder. HomeBlogThe BibleWhat Can We Learn from Cain and Abel? The First Brothers in the Bible, Cain And Abel, Also Provide the First Account of Sibling Rivalry. Cain and Abel worship God by giving him some of the output from their work. God accepts Abel’s gift but doesn’t accept Cain’s. The Bible doesn’t explain why. Though many people speculate on the reasons, we just don’t know. There is, however, an implication that perhaps Cain sinned, either in his offering or in some other area of his life. Whatever the reason for God rejecting Cain’s gift, Cain becomes angry. The Bible is unclear about the focus of Cain’s anger. Was he angry at God, or jealous of his brother’s spiritual success? Both are reasonable assumptions. However, regardless of the source, Cain takes action against his brother Abel. The Story of Cain and Abel Teaches Us Five Things. Worshiping God is serious business: The Bible tells us to worship God in spirit and truth (John 4:24). We can go through the motions, and we can pretend. But God isn’t fooled. He wants us to give him our very best. This isn’t because he needs something from us but because he deserves it. We must control our anger: When Paul says to be angry and sin not (Ephesians 4:26), he implies anger is okay as long as we don’t allow it to cause us to sin. Cain’s anger caused him to sin. Leave punishment in God’s hands: Whether out of anger or retaliation, Cain executes judgment on his brother. Cain kills Abel. This, however, doesn’t solve the problem. It just causes a new one. There are consequences to sin: Now Cain must answer to God for what he did. Even though God is merciful in judging Cain’s sin, it’s still more than Cain can bear (Genesis 4:13). Seek a Better Way: What if, instead of Cain getting mad and killing his brother, he sought to worship God in a better way? He could have asked God what he did wrong and what he should do differently. Or he could have asked his brother for help. Had Cain taken the high road instead of lashing out in anger, we could have had a much different outcome: two brothers getting along and helping one another worship God.